The 14 Best Hiking Trails in Rhode Island! Rhode Island may be the smallest state in America, but it’s certainly not lacking in geographic diversity. From cliffs to oceanfront walks to a hike in the forest, you won’t be disappointed by the landscapes that Rhode Island has to offer. 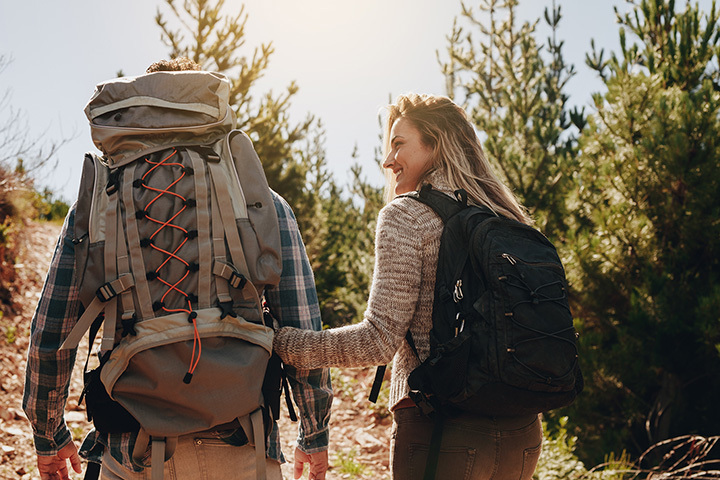 Bring your hiking boots for more strenuous walks or your furry friend for easier strolls, but no matter what be sure to get out there and enjoy the Ocean State’s gorgeous trails! This coastal hike is beautiful, quick, and relatively flat. It’s a perfect hike for beginners, and the two gravel loops are less than two miles long, offering great ocean views without having to climb. Photographers will love snapping charming photos of the migratory birds that visit this area before winter, too—red-tailed hawks and mockingbirds have been known to frequent the park. This trail in Newport, Rhode Island, may be difficult to some, but is well worth the strain. The trail offers backyard views of Newport’s most famous residences. Look to your other side and you’ll see a lovely, rocky coastline. Don’t expect this to be a refuge of peace though—the famous trails are often laden with tourists also hoping to take in the spectacular views. Located in West Greenwich, this area’s four interwoven trails are beautifully maintained by the Nature Conservatory. The pond, overflowing with lily pads in the summer and frosted with ice in the winter, offers a peaceful, idyllic environment. The landscapes you’ll observe along these trails were in fact sculpted by a glacier years ago. This rich geographic history is exemplified by the region’s carved canyons and indented kettles, which have now formed charming ponds. Follow the trail of this nature preserve and you’ll encounter the site of an Amy Air Corps airplane crash dating back to 1943. At its site, you’ll find a memorial paying respects to the three men who passed away in the crash. On your way back, choose between several easy and hard routes. Don’t forget to stop by nearby Stump Pond along your way. If you’re looking for a descent into nature without having to go too far from the city, look no further than Neutaconkanut Hill. The hill marks the highest spot in Providence, and is located around the Silver Lake and Olneyville neighborhoods. The spot has its share of history, too—in the past, the hill was a boundary between Rhode Island and the territory of the Narragansett Tribe. This fairly-trafficked route is located close to Providence and can be visited between April and November. It’s a great hidden gem that’s perfect for walking your dog or picnicking. During the summer, you may even spot a few adventurous souls canoeing along the lake. This beautiful walk will take hikers through a variety of terrain, including creeks, woods, boulders and dirt roads. As this trail loops through the sites of some colonial-era towns, you may even see remains of some stone walls here and there. Be warned, the trails aren’t well marked, so you may want to bring a GPS. Those seeking solitude will appreciate this long, 17.8-mile loop near West Greenwich, Rhode Island. There are many trails, and you won’t only see hikers but also mountain bikers and geocachers as well. This trail meanders between woodland scenes and lake views, but it may just take you along the roadway for a bit, as well. Joggers and mountain bikers love these trails, as the 3.5-mile loop is lengthy enough to be strenuous but not exhausting. This nature sanctuary provides visitors with a charming view of Rhode Island’s diverse ecosystems within an estuary setting. The land has long been important as a breeding ground for fish between Long Island and Cape Cod. While you may not observe many fish, you’ll be sure to spot plenty of birds! Take a leisurely stroll to Mount Hope Bay along this trail’s 2.5-mile stretch. The trail is paved, which makes it an easy route for those just wanting a breath of fresh air. On Saturdays, visitors can end their hike by visiting the farmer’s market, open from 9 a.m. to 1 p.m. In Tiverton, seven miles of pathways run wild through the woods, marked by easy inclines and rocky trails. Before colonial times, the Pocasset tribes fished and farmed off of this area’s lakes and woodland. View more Rhode Island Hiking Trails.